Y’all I am excited to present my very first sweater pattern! This is version 2 of this pattern as I streamlined and modified it. Now for a disclaimer. 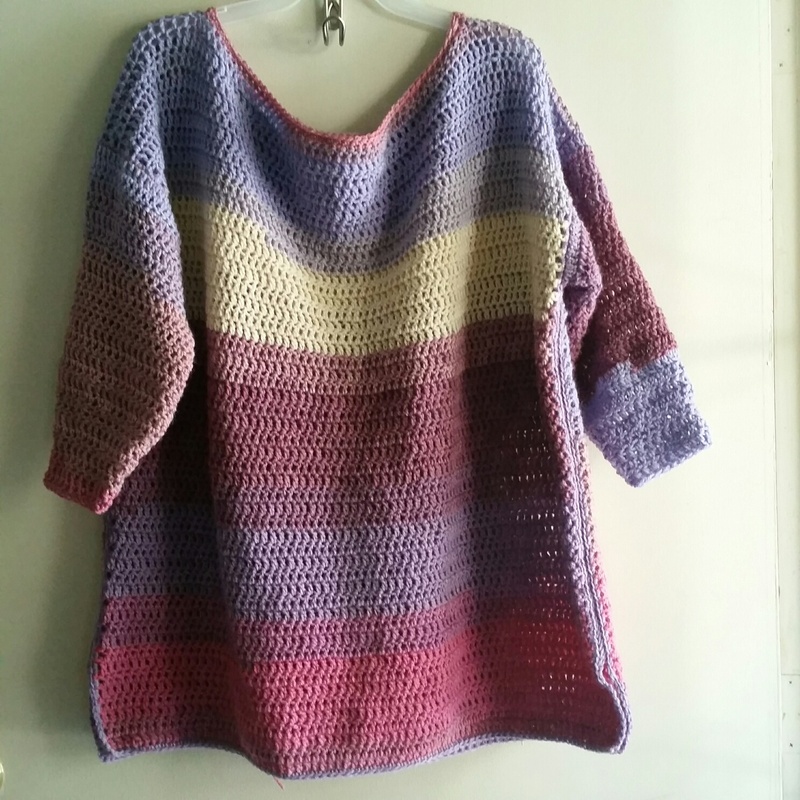 I’ve lost a bit of weight (50 lbs and counting) and I found that when it came to designing this sweater based on my old dimensions, I am sad to say, didn’t quite work out the first time when I made version 1 too big. I am also not familiar with sizes smaller than me, and because of these 2 reasons, I designed this sweater in a way that you can modify to fit your needs. I’ll present the pattern as written as I believe it is should fit from an x-large to 2x (I think!). I was looking for something that was not form fitting but rather a loose style. The sweater is done in one piece, with the arms added on. It is a basic stitch, so if you’re an advanced beginner you should be able to make this. This design may take up to 20 hours depending on your skill. 2.5 Skeins of Mandala in Wood Nymph or color of your choice. Please note that Magic Ice Yarns would also work but you will need more skeins since they have less yardage than the Mandala. Or any DK/size 3 yarn that is similar. No gauge is given because this design is truly one you can make your own. Please note, I used the chainless dc method instead of ch 3 to start the next row. Here is a video showing the chainless dc method. Row 53-100 Chainless dc (or ch 3) and dc in each stitch to the end. (80 dc). Without fastening off (unless you prefer a different color) at the bottom, making sure you are working in the front of the sweater, ch 1, and sc in each stitch to the first corner. In each corner, you will do 3 sc. On the long side of the sweater, you will do 2 sc in each chainless dc space (or ch 3 space. Just repeat until you get back to the first sc. Fasten off. Turning the sweater to the wrong side, to keep the slit, you will count out 14 stitches from the bottom and add a piece of string or stitch markers. Not counting where the stitch marker is, you will now sc the sides together for 57 sc. Make sure that you are going through the blo on each side for the design. You will do this on each side. Fasten off. For the arms, you will be turning after each round. Round 1 Ch 1 (does not count as a stitch), then dc in same stitch, and then dc in each stitch around. The last 3 stitches you will do 3dctog (please review video here if you need to see how to do this) to make sure there is no gap. You should have 61 dc. Turn. Please note you don’t have to make the sleeves long as written you can stop anytime. Add or leave off with whatever you comfortable with. For short sleeves, you can stop after round 7. Round 21 - 24 Ch 1, then dc in same stitch, dc in in each stitch around. Turn (24 dc) Fasten off. Start with the row where you crocheted around the chain for the neck opening. Start with your yarn, you will start here. Round 1 Ch 1 (counts as a sc) then 49 sc between each dc (around the chain), when you get to the first corner, then 2sctog, then another 48 sc until you get to the next corner, then 2sctog. Sl st in 1st st.
And there you have it, your very own sweater. Forgot to take pictures but hopefully, I wrote this to be easily understood. Any questions, reply here or on Ravelry. Love the colors you chose! And this looks about like my size. Congrats on shedding 50 pounds; I would love to do the same.